The growing Muslim market requires food prepared in a certain manner but labeling can be confusing. Cui Jia reports in Beijing. With shopping basket in hand, Hu Yi and his young son went through the shelves at a supermarket in Beijing’s Niujie Street. For 5 year old Yicheng it was just a regular grocery trip with his father, but Hu, a member of the predominantly Muslim Hui ethnic group, had another agenda – to teach his son how to shop for halal food. Niujie Street, or Ox Street, lies in the center of Beijing’s Muslim quarter. Under the section headed “Muslim supplies”, the supermarket also sells taqiyah, the distinctive skullcaps worn by many believers, and small carpets for them to kneel on while praying. “Let’s see if you can find us some tasty beef jerky,” Hu, 32, encouraged his son. Yicheng jogged off happily and searched through the aisles. A few minutes later, he returned with three packets of jerky. “Remember, what’s the first thing we have to check before putting them into the basket?”asked Hu. “The sign of qingzhen (halal),” replied Yicheng, pointing at the back of the packet, where a round, green logo displayed the word “halal” in Chinese characters and Arabic script. In Arabic, halal means permitted or lawful. Halal foods are those that are allowed under Islamic dietary guidelines based on the Quran, the holy book of Islam. Muslims are prohibited from consuming alcohol, pork, blood and blood products, and meat from animals that have died accidentally or from natural causes, or have been slaughtered in the name of any god other than Allah. One of the packs of jerky Yicheng had collected didn’t bear the stamp of approval, and so he was instructed to put it back on the shelf. “Halal food is extremely important to us. It is never a small issue. For us, the first priority is whether the food is halal or not. Quality is a secondary issue,” said Hu. There are more than 23 million Muslims in China. Combining Islamic dietary guidelines and local culture during the past 1,200 years, they have adopted some culinary traits from the Han Chinese and created their own style of halal food. More than 97 percent of China’s cities and counties have halal food manufacturers, according to China Inspection and Quarantine magazine earlier this year. “The logos look a bit different,” said Yicheng, as he placed the packets in the basket. His father explained that it’s because the goods were produced in different provinces. In China, halal food producers must have their products certified by local ethnic affairs commissions under regulations passed by provincial and regional lawmakers. If they meet the standards, producers are allowed to display a halal logo, designated by province or region, on their packaging and products. The Ningxia Hui autonomous region, where Muslims account for more than 35 percent of the population, implemented its local halal food regulations in 2003, before revising them in 2011. The revised regulations are stricter than the original version. In addition to the original requirement that the owners of halal food producers and key staff members who deal with food must be Muslim, the updated regulations require that all those in managerial positions must also follow the faith to guarantee the food chain won’t contaminated by the introduction of non-halal products. The regulations also prohibit the presence of non-halal food and ingredients in halal food factories or restaurants. The regulations vary from place to place and region to region, but all are based on Islamic dietary guidelines. The regulations in Ningxia and the Xinjiang Uygur autonomous region, implemented in 2005, require that when an animal is slaughtered, the jugular vein must be cut and the blood allowed to drain freely from the animal. Moreover, staff must ensure that they do everything possible to reduce the amount of pain the animal endures believers claim that slaughtering an animal in the halal fashion cuts off the oxygen supply to the brain and inhibits pain receptors. The animals are also blessed with prayers. “In collaboration with the local administration for industry and commerce, we conduct random inspections, covering everything from large slaughterhouses to small noodle restaurants, to ensure that no one carries out non-hahal activities in these places,” said Ding Yi, director of the halal certification management office in Ningxia. He said the region now has more than 10,000 certified halal producers and restaurants. “The halal logos can be confusing, because there are so many designs on the market. Why can’t there be just one?” asked a perplexed Hu. Hu’s question is a simple one, but before China can unify its halal logo, it will first have to codify the local regulations into a national law, said Jin Chunzi from the politics and law department of the State Ethnic Affairs Commission, who has spent the past eight years working on the formulation of the country’s first law on halal foodstuffs. However, a lack of public and official awareness about halal food and its importance to Muslims has resulted in difficulties in formulating the new laws, with some protagonists arguing that it’s unnecessary to draft a law based on ethnic tradition. 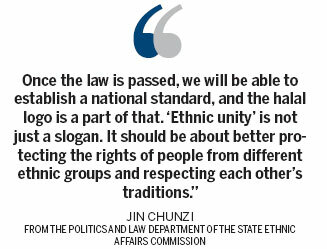 Jin Chunzi disagreed. “It (the law) will actually help to maintain social stability,” she said. “The misunderstandings about halal food and a lack of law enforcement caused a lot of conflicts in the past,” said Jin Rubin, who is in charge of supervision and certification of China’s halal food exporters at the China Islamic Association. Although Jin Chunzi declined to specify a timetable for passing the law, she said legislation regarding halal food at national level is in progress. “We held a competition to design national halal food logos last year. Five designs were chosen and earlier this year they were sent to local ethnic affairs commissions for consultation.” All five logos display the word halal in Chinese, English and Arabic. Radil said an increasing number of Chinese enterprises have noticed the global growth of the international food market for Muslims, but the process of obtaining international certification is both lengthy and costly – candidates have to cover the travel expenses of the foreign inspectors and it can take as long as six months for a certificate to be issued – and many would-be suppliers have decided not to pursue the market as a result. Local certification is not the answer, either. “Muslim countries will never recognize products that have only been passed by local ethnic affair commissions,” he said. At present, there are more than 1.8 billion Muslims globally, almost a quarter of the world’s total population and the growth rate of the Muslim population could be four times as rapid as that of non Muslims, said Jin from the China Islamic Association. The annual global trade in halal products was worth $150 billion in 2008, but exports from China average out at just $100 million annually. “The market demand and business opportunities have emphasized the need for China to speed up the process of creating a national standard,” added Jin Rubin. Ningxia was allowed to establish its own international Halal Food Standard in 2009, as part of a trial. That standard is now recognized by seven countries, including Saudi Arabia, Egypt, Qatar, Australia and Malaysia, which means certified foodstuffs from the region are automatically eligible for export to those countries. “At the moment, we mainly certify manufacturers within Ningxia,” said Wang Shengjun, director of the region’s international certification center. The region’s most popular exports are meat, honey and dehydrated vegetables. “A large milk powder company from southern China approached us once to obtain certification, but they decided not to continue with the application after learning that all key workers must be Muslims. They felt unable to guarantee that would be the case,” said Wang.